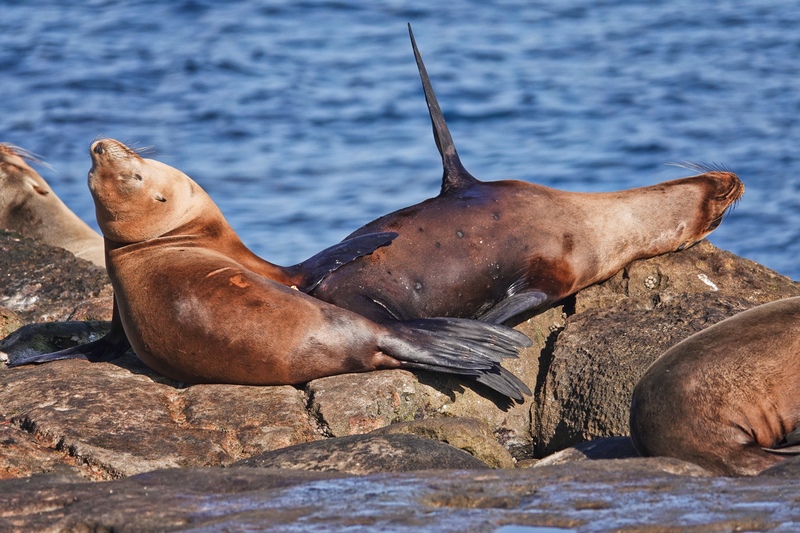 The good life… Sea Lion style. Sea Lions are the original bathing beauties…and they spend a good deal of their lives sun bathing on the rocks. Living the good life in Southern California. 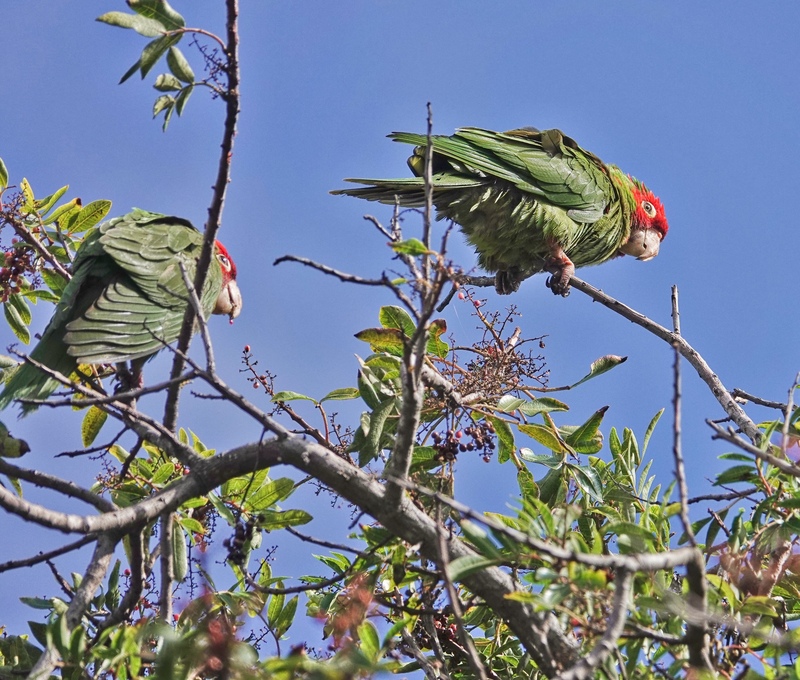 These beauties are at La Jolla Cove north of San Diego. Sony RX10iv at 600mm equivalent. Program mode with my custom birds in flight and action modifications. 1/1000th @ f4 @ ISO 160. Processed in Polarr. Sally, my daughter, and I found a couple of Dusky-footed Woodrats uncharacteristically out and about in daylight, feeding on flower petals along the path in Tecolote Canyon Nature Park in San Diego, California. She almost stepped on one right at the trail-edge while looking at birds. I managed to get this shot through the thick foliage. I know. 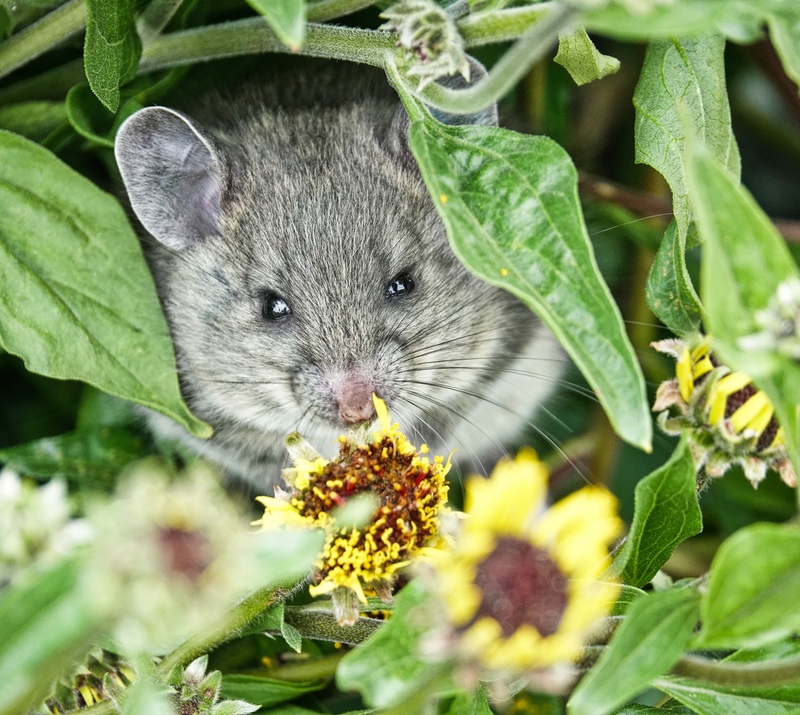 It’s a rat, and many people have a thing about rats…but it is one of our few native rats, and an interesting creature. It builds large domed nests of sticks and litter (and sometimes adds a tree loft in a nearby tree), often in villages or hamlets of a dozen or more nests (perhaps the origin of its common name, Pack-rat, though it is a solitary creature in all other ways), stores food, builds a separate “toilet” faculty away from the nest, has soft fur and furry tail. I find it appealingly cute…certainly as cute as any gerbil or hamster. 🙂 Sony RX10iv at 600mm equivalent. Program mode with my custom birds and wildlife modifications. 1/250th @ f4 @ ISO 500. Processed in Polarr. 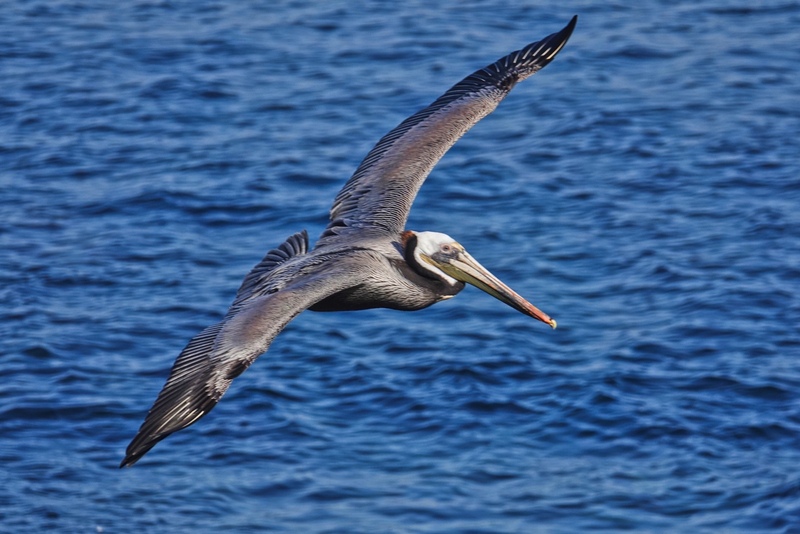 Pelicans are among the best birds to practice your Birds in Flight skills on. 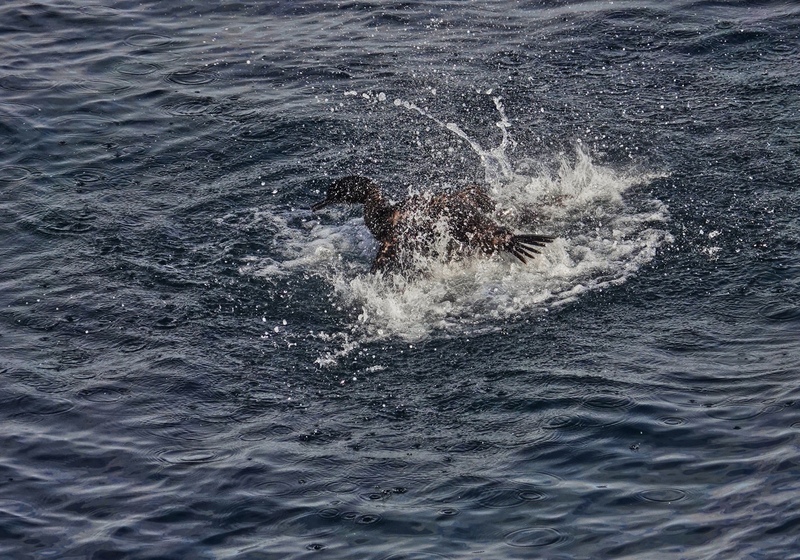 They are big, so the camera focuses well, and when they are using the air currents over waves or breaking surf, or along a cliff, their flight is relatively predictable, so they are easy to track. Plus, the boldly textured feathers in all seasons, and the colorful breeding plumage in season, make them attractive subjects. Finally, shooting from sea cliffs in southern California, they are often at or below eye-level. 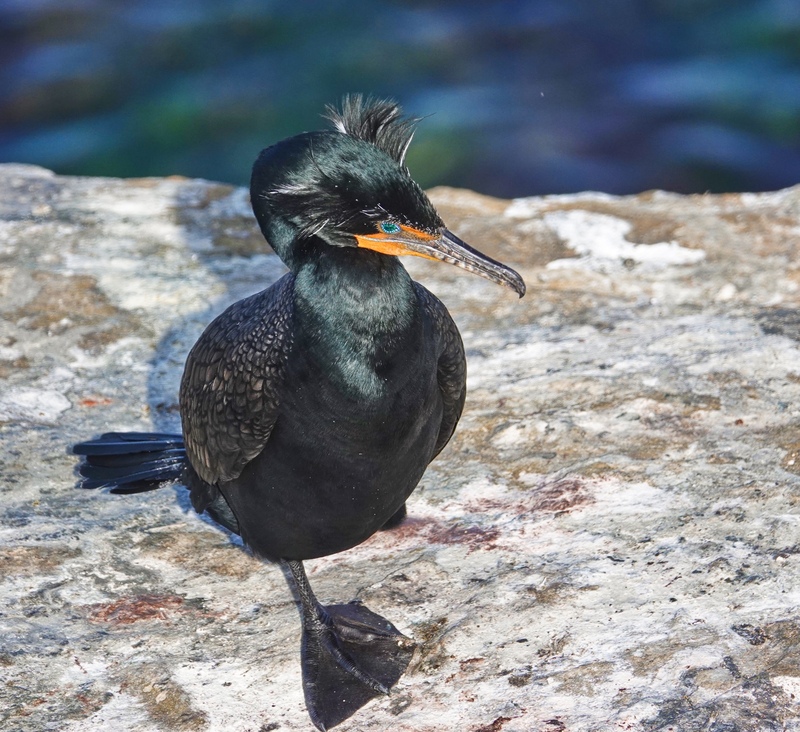 This bird was below the cliffs at La Jolla Cove in La Jolla, California. Sony RX10iv at 600mm equivalent. Program mode with my birds in flight and action modifications. 1/1000th @ f4.5 @ ISO 100. -.3EV. Processed in Polarr. I think it might be the guano streaked cliffs behind the bird that give this shot, to my eye, a slightly prehistoric aspect…and the pose of the bird below only adds to the effect. In reading this morning I discovered that the modern Pelican probably dates back 30 million years, so, yes, the bird is indeed legitimately prehistoric. La Jolla Cove, California. Sony RX10iv at 600mm. Program mode with my birds in flight and action modifications. 1/1000th @ f4 @ ISO 400. Processed in Polarr. This is a good example of the tracking auto focus of the RX10iv. I have the whole sequence of the bird coming in and landing. 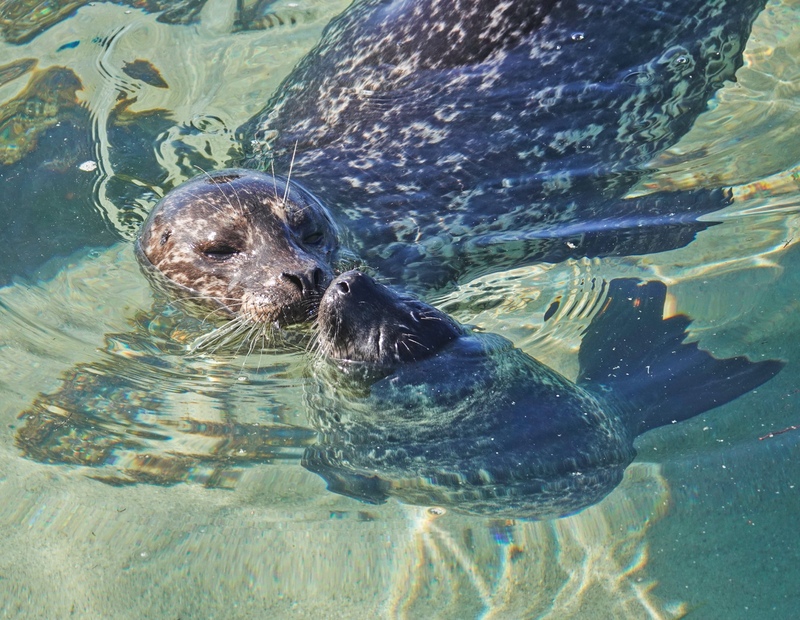 A mother and a new-born Harbor Seal recognize each other by the unique smell of each other’s breath…but it has to be learned and you can observe mother and child nose to nose soon after birth and repeatedly over the first few hours of life exchanging breaths. Later, when the pups are in the water and crying for their mothers, you will see adults approach the pup and check the breath to see if it is theirs. Adult females can be quite aggressive when approached by a pup that does not have the right smell. I always enjoy these nose to nose shots. 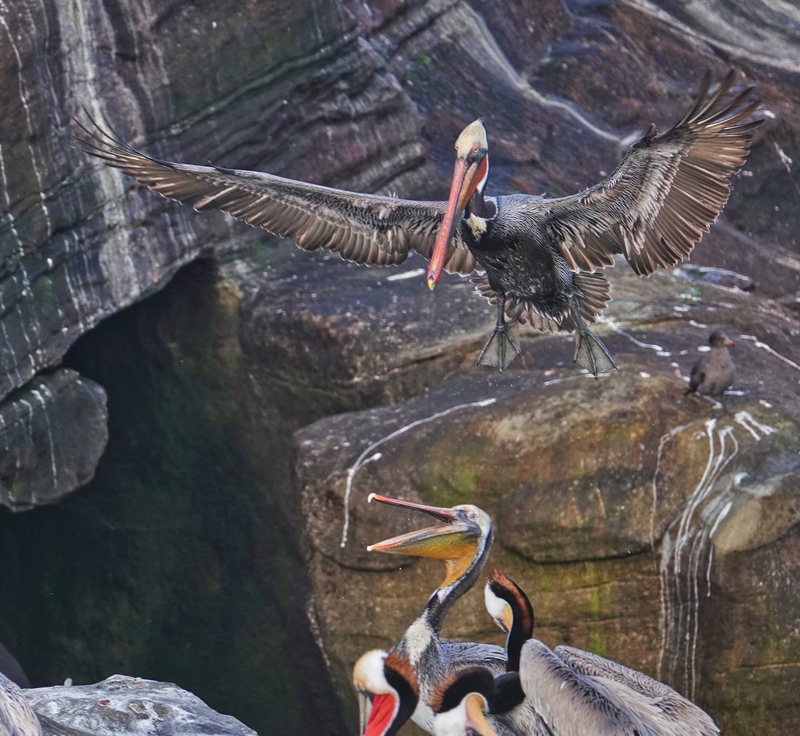 This was taken on the outside of the seawall at the Children’s Pool in La Jolla Cove, in La Jolla, California. Sony RX10iv at 600mm equivalent. Program mode with my birds in flight and action modifications. 1/1000 @ f4 @ ISO 250. Processed in Polarr. At the other end of La Jolla Cove from Children’s Pool and the pupping Harbor Seals, there is a good sized colony of Sea Lions. This group of adolescents was having a mild altercation over the occupation of some rocks above the shoreline. 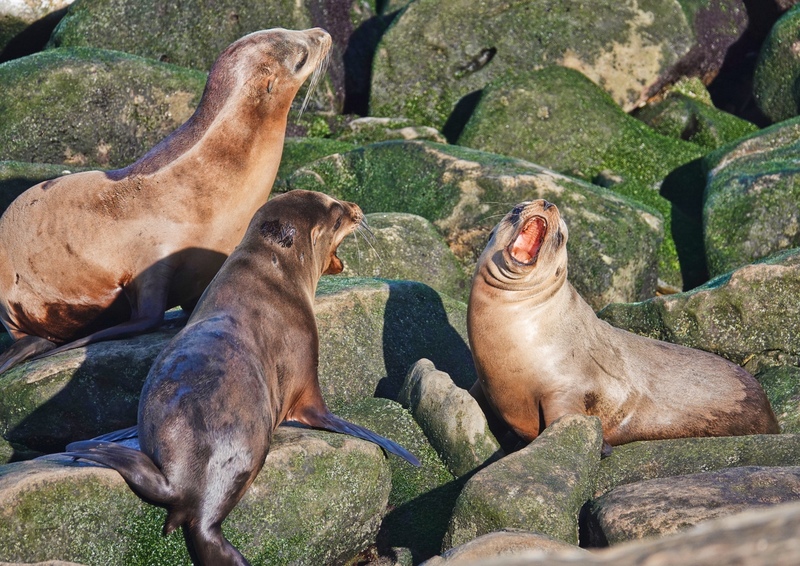 It is rare to see an adult sea lion without scars…so these confrontations do get more violent as the sea lions mature. La Jolla Cove, California. Sony RX10iv at 600mm equivalent. Program mode with my custom birds in flight and action modifications. 1/1000th @ f4 @ ISO 160. -.3 EV. Processed in Polarr. While we were watching Western and Clark’s Grebes at Lake Hodges, at the north edge of San Diego, this Western came in close to shore, apparently to see what we were doing, and to make sure we were no threat. It is mating season and this is, again apparently, a territorial display. 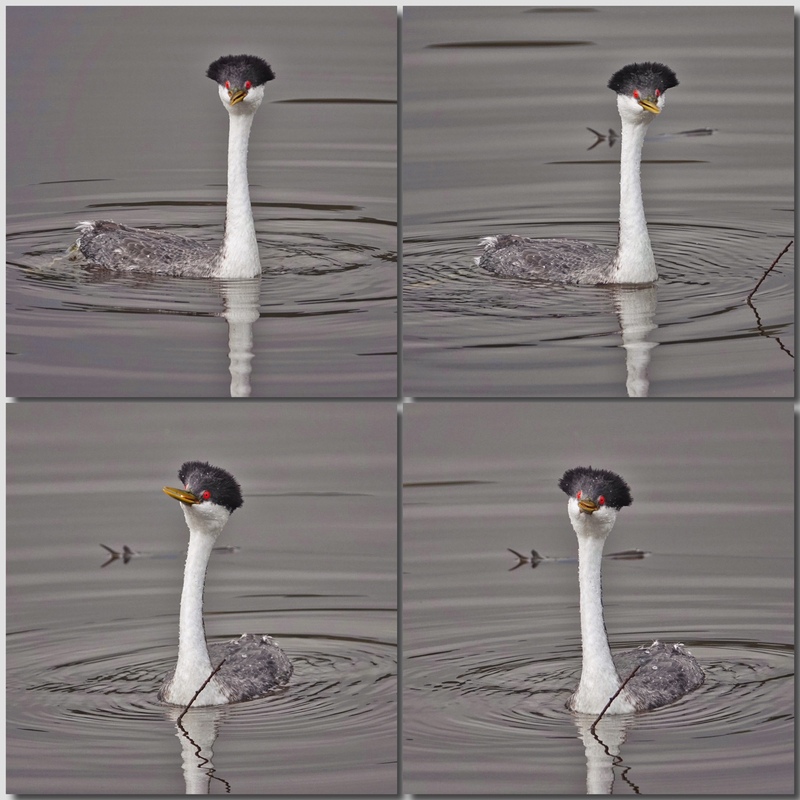 With those red eyes, it does not take much to make a grebe intimidating. 🙂 Sony RX10iv at 600mm equivalent. Program mode with my custom birds in flight and action modifications. 1/1000th @ f4 @ ISO 160. -.3EV. Processed in Polarr and assembled in FrameMagic.